Tax Day is Monday, and you can celebrate with a host of great food freebies and deals. Following are a few of our favorites. All deals are good on April 15, unless otherwise noted. You might want to call ahead to locations near you to confirm that they are participating in these offers, though. Get a Half Chicken Individual Meal and drink for $10.40 at Boston Market. The Tax Day 1040 Special is good now through Monday, and no coupon is necessary. Grab the Big Bagel Bundle — which combines your choice of 13 small-batch New York-style bagels with two tubs of cream cheese — for $10.40 now through Monday. 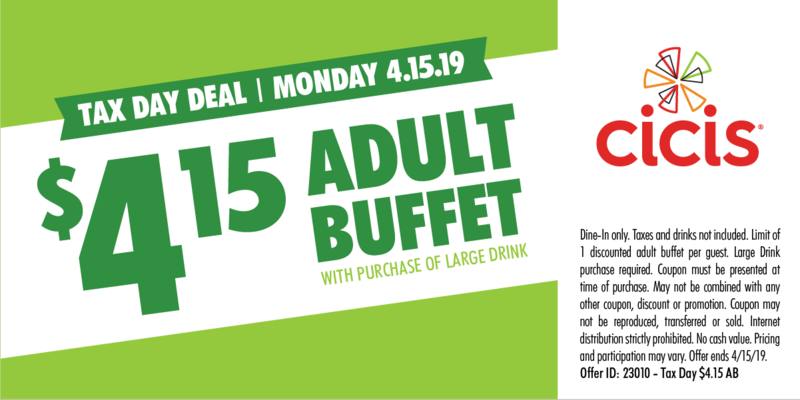 Cicis will offer a $4.15 adult buffet when you purchase a large drink. The deal is dine-in only, and you must present the coupon. 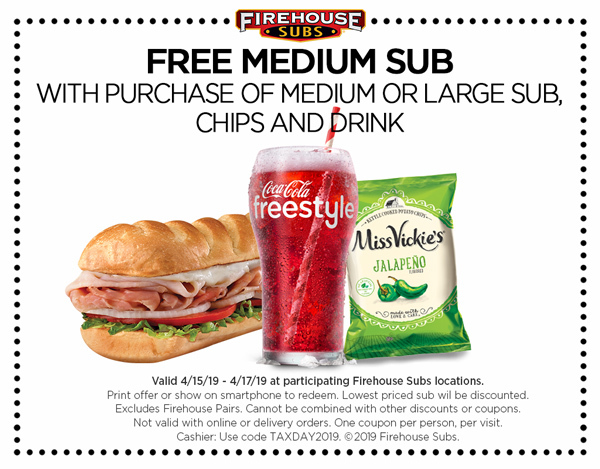 Bring this coupon to Firehouse Subs and you can get a free medium sub with the purchase of a medium or large sub, chips and drink. The deal is good Monday through Wednesday. If you prefer a sweet treat, stop by a participating Great American Cookies location and get a free Original Chocolate Chip Cookie. Grimaldi’s Pizzeria will offer traditional cheese pizzas for just $10.40, a spokesperson tells Money Talks News. Visit a Hardee’s between 7 a.m. and 10 a.m. Monday, and utter the phrase “Made From Scratch,” to be rewarded with one free Made From Scratch Sausage biscuit. Stop by your favorite Hot Dog on a Stick location for a free turkey dog or veggie dog. According to the franchise, “no purchase or proof of completed taxes” is necessary. NoodlesRewards members receive $4 off online and mobile orders of $10 or more, now through Monday. Buy one sandwich at Potbelly and get a free sandwich of equal or lesser value. To score the deal, use your Potbelly Perks account — or, if you don’t belong to the program, remind the cashier it is Tax Day. Visit Schlotzsky’s and get a free small The Original sandwich when you purchase a medium drink and chips. Do you know of more great Tax Day deals? Share them in comments below or on our Facebook page.